Non-Communicable Diseases are those diseases which are chronic and generally progress slowly. The four main types of noncommunicable diseases are cardiovascular diseases (like heart attacks and stroke), cancer, chronic respiratory diseases (such as chronic obstructed pulmonary disease and asthma) and diabetes. These diseases are not passed from person to person. 61% of death in India happens because of non-communicable disease. 58.17 lakh deaths in India due to Non-communicable Disease in 2016. Cancer, diabetes, heart disease accounts for 55% of premature mortality in India in the age group of 30-70. Almost 23% of the population is at risk of premature deaths due to non-communicable disease. NCD’S are responsible for 70% deaths worldwide. Four Risk Factors responsible for the significant proposition of these diseases are tobacco use, unhealthy diet, physical inactivity, and harmful use of alcohol. The major metabolic risk factors are obesity, raised blood pressure, raised blood glucose and raised blood cholesterol levels. 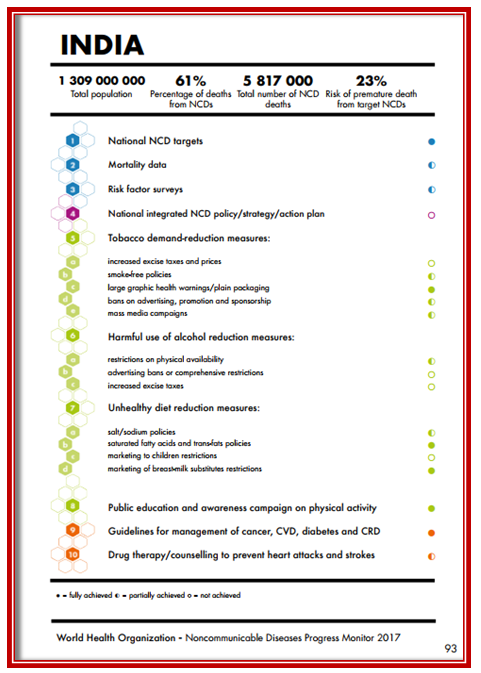 Cardiovascular disease (coronary heart disease, stroke, and hypertension) contribute to 45%of all NCD deaths followed by chronic respiratory disease 22%.